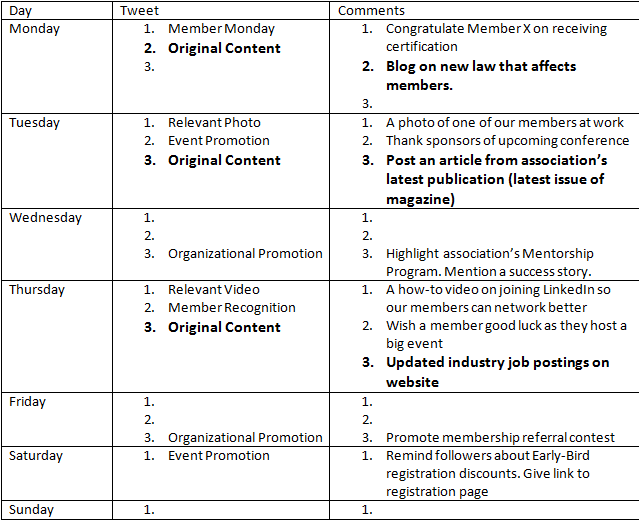 A content calendar is essential to successfully managing an organization’s social media platforms. A content calendar is a day-by-day, week-by-week or month-by-month schedule detailing the type of content you will be posting on social media. A content calendar is a lot of things, but its main draw is that it keeps you focused, efficient and effective. A content calendar keeps you focused on the articles, issues, programs and announcements that are most relevant to your community. A calendar helps you to be more efficient so you’re not sitting at your desk for hours every day thinking of content to post about. 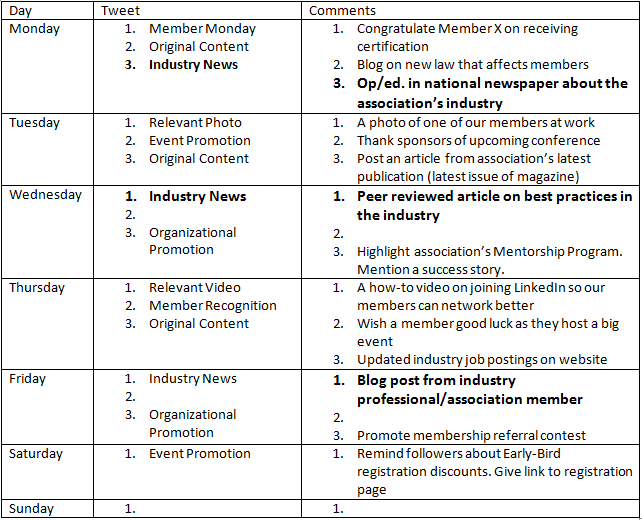 A calendar also helps you monitor which topics are most popular as well as which posts are most engaging. – Don’t marry your content calendar. Be flexible. If breaking news affects your organization’s community, make room in your calendar for a post about it. If a member does something worth noting on a particular day, recognize it, even if it’s not in your original plans. – Keep track of its effectiveness. Once you have a calendar in place, keep an eye out for which topics, which days and which times get better engagement. Tailor your calendar to this data and, once again, be ready to be flexible. – Consult colleagues and members when building your content calendar. Ask them if there are any issues that you should focus on or if there are any members doing anything notable in the near future. 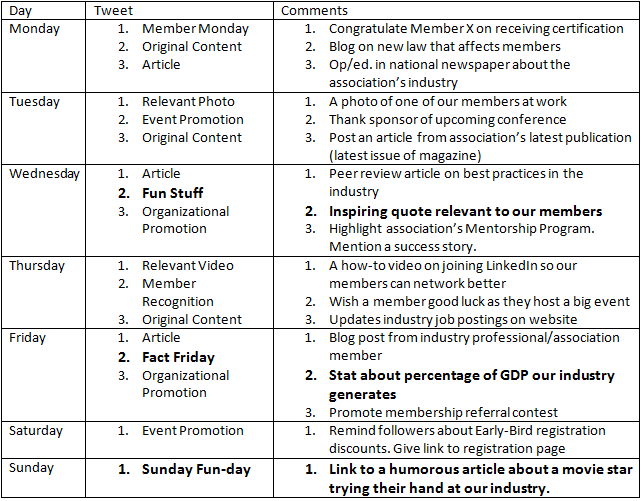 *This content calendar is based on 17 tweets per week (three per weekday and one each on Saturday and Sunday). 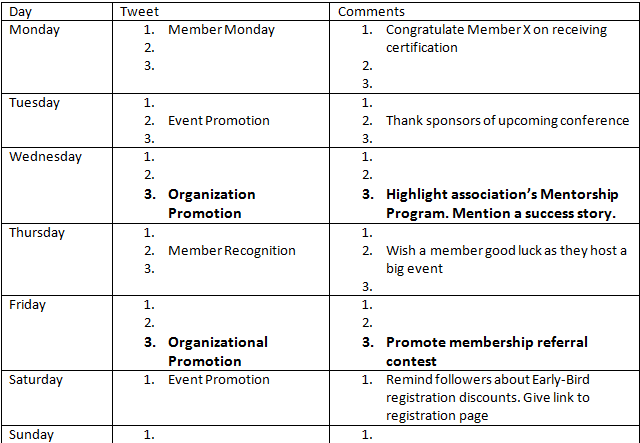 Recognizing members is crucial to your organization’s success. After all, helping members succeed is what your organization is all about, isn’t it? 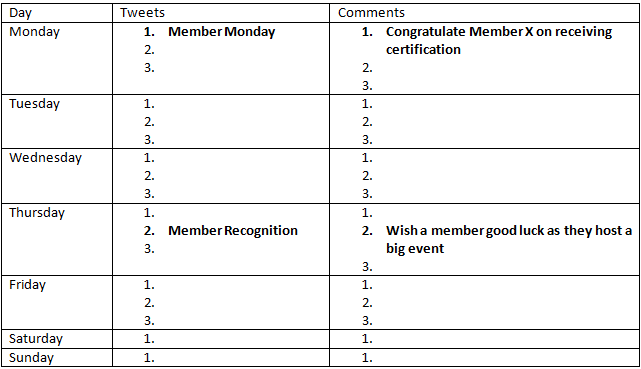 Show your members you care and show the world that your members achieve great things by frequently recognizing your members. 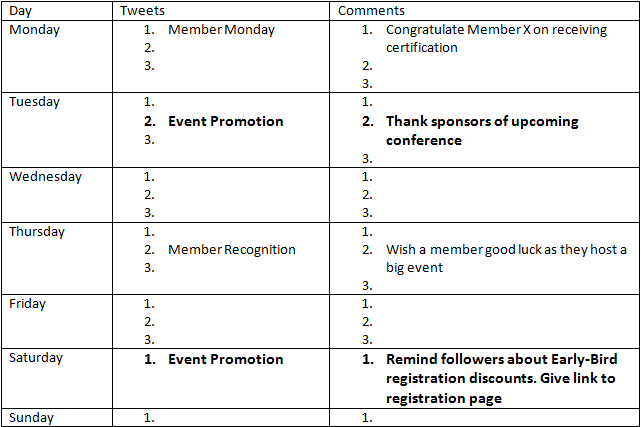 Twitter is a great platform to promote your organization’s events, whether it’s a fundraiser, a conference or a networking meet up. 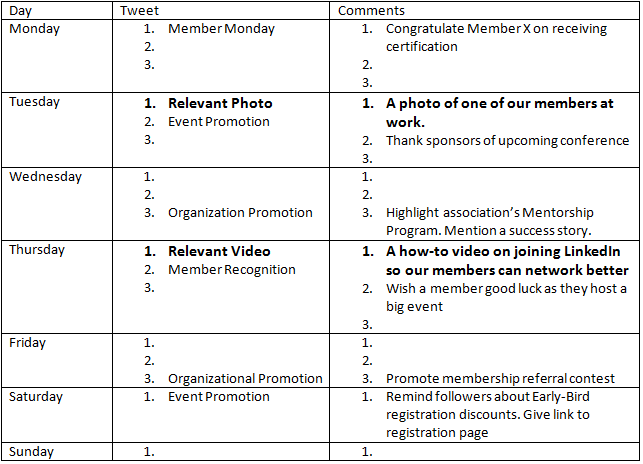 A content calendar will help you organize your thoughts on the event, remind your members without annoying them and target different demographics by generating fresh perspectives. Your organization probably has a whole lot of programs, initiatives and benefits you want your members to take advantage of. Tweeting about them is a great way to not only let people know about these initiatives, but also how your community can access them and benefit from them. Highlighting these promotions in your content calendar helps you pinpoint the right promotion to showcase, at the right time, in the right way. When we say media, we mean pictures, videos, infographics and the like. Visuals have been shown to help boost engagement and can be added to a tweet about an event, a how-to or member recognition to give it more oomph. Sometimes media takes a while to source, as you may have to comb through several resources, like followers who are members or YouTube, to find a perfect fit. That’s why scheduling media will help you save time and still be aces online. Original content is content that your association or non-profit has created itself and is not from another source, such as an organization’s blog, an open letter from the president, a newsletter, etc. Original content is absolutely crucial to engaging your community and getting the most out of social media. Original content drives traffic to the website, gets people talking and shows your organization in action. Developing the right timing for posting original content is part a great social media strategy, which why a content calendar can be your best friend. Sparking engagement and creating value for members is all about providing relevant content that will be useful to your organization’s community. Tweeting about the latest news, trends and techniques in your association’s industry will definitely help you stay relevant and valuable to followers. Finding the most relevant material and fitting it into your content calendar ensures that your members receive the most timely news from the best sources without overloading them with information. You’re organization’s Twitter account is informative, engaging, promotional and helpful, but it has to let its hair down once in a while. Your members will appreciate some fun, relaxed, but still relevant content on your Twitter account every so often. Show your members they can have fun by following your account; it could lead to a lot more loyal followers and increased engagement. And there you have it, a complete week’s worth of content all mapped out! Remember, a content calendar is important to effective, efficient tweeting, but also remember to have some fun with it and be ready to change things up if current events drop from out of the blue. This entry was posted in Uncategorized and tagged Association, Content Calendar, Events, Member Recognition, Non-profit, Social Media, Twitter by inclinemarketingservices. Bookmark the permalink.